As much as Valerie Anne Poxleitner aka Lights herself is the very image of perfection, sometimes it can be difficult to get past the whole "dance vibe" of her songs, if that's not your thing, and see them for what they are. 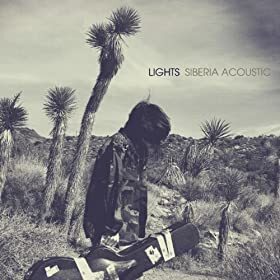 Siberia Acoustic strips off the synths and eradicates the electro, but the leaves the simple structural beauty in tact, and this is where Lights truly comes into her own. Showcasing an incredible vocal range and complexity, the record blindly speaks for itself and the aural experience outshines the aesthetic. 2011’s Siberia was pretty rad in its own right, but Siberia Acoustic manages to take it to an entire new level. Whilst tracks like ‘Toes’ may lose their playful element in the loss of synth, the door is opened up to a world of possibility in both power and vulnerability. The album allows Lights certain stand-out collaborations, helping to put a new spin on old favorites. With the help of Adam Young, aka Owl City, the already ballad-like ‘Cactus in the Valley’ is transformed into a harmonious duet full of intrigue and wonder. The melody of the piano combines beautifully with the almost ethereal tone of Lights' voice to create nothing short of a work of art. ‘Suspension’ is given a whole new dimension simply in its slower pace, removing the slightly futuristic edge in favor of more innocent tones. Similarly, ‘Peace Sign’ is given an entirely new layer in its contributions from the lovely Coeur de Pirate, as she tumbles out a tirade of French - such quirks simply adding to the illusion of romance and intrigue that seem ever-present on an acoustic record such as this. On previous records, some might say a certain vocal quality has been lost or perhaps disguised when compared, say, to Lights’ live performances. There’s none of that here. No matter what your previous impressions of Lights may be - cast them aside. Siberia Acoustic is a truly different experience which allows appreciation of the overwhelming beauty of her talent and thus the true basis of her appeal. A far cry from an excuse to cash in on the whole acoustic trend to make money out of loyal fans, this is the most emotive offering yet, which has simply been dying to come out of the woodwork. If it doesn’t make your hairs stand on end and send a shiver down your spine, well, you might actually be heartless. Siberia Acoustic is out now.